Celtic tongue gives Muscovite business opportunity. In 2014, Moscow State University graduate Yury Andreichuk launched Russia’s first Irish-language course, writes small business portal biz360. Now Andreichuk teaches between 40 and 50 students. One class in a group of six to eight people is $15. Andreichuk also gives private lessons and teaches residents of other cities on Skype. Given the current trend, Andreichuk expects the number of his regular students to reach 100 people in the next three years. “After obtaining necessary licenses I want to create a school of small European languages. Irish will play a key role for the time being,” biz360 quotes him as saying. In Russia, you can learn Irish at a serious level only at Moscow State University. Even in Ireland, the rare tongue is spoken by only 10 to 15 percent of the population; about 80,000 people speak it daily. Motivations to learn such a rare language differ: one student wanted to sing Irish songs; another wished to find friends in Ireland. 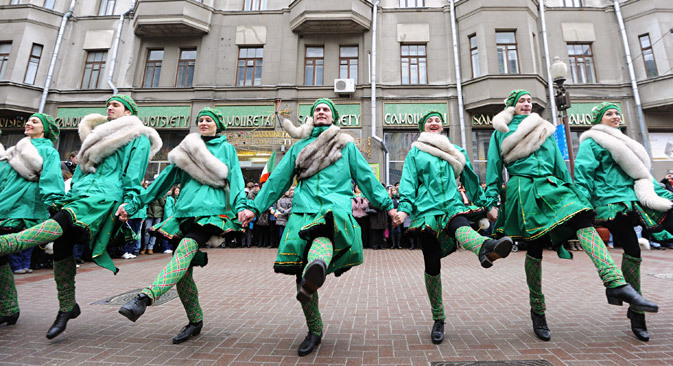 “I use every possible public event related to Irish culture in Moscow to promote the Irish language and my course,” Andreichuk says. A fan of Celtic culture, Andreichuk has performed as a singer with his own traditional Irish music band Slua Si (Voinstvo Sidov) and taught Irish singing for more than 15 years.